I replied to Marvella: “The bus stop nearest the Crown Club Delta Mar Reception is the Riviera del Sol bus stop. If you don’t need to go to the local Crown Resorts Reception at Club Delta Mar first and are going straight to your Club Caronte apartment, then walk 200 metres back towards Fuengirola. That is in the direction you have just come towards Fuengirola and you’ll see a taxi rank next to the Riviera del Sol shopping centre. For a minimum fare a taxi will take you the short final leg of your journey up the hill to the Caronte resort. Two days after my reply to Marvella I drove to the Riviera del Sol to double check the information I gave her. My GPS said Club Caronte Crown Resort was 1.3kms or 3.5 minutes by car from the Riviera del Sol roundabout. I went up to the resort and then to the Club Delta Mar Reception right next to the Riviera del Sol bus stop to get more information. I spoke to Lucia the very pleasant Receptionist on duty and she explained to me how the different Crown Club receptions worked. 1) Crown Club Delta Mar Reception serves the Delta Mar resort, the La Riviera resort and the Club Caronte resort. The Caronte resort is higher up the hill and Crown Resorts recommend the use of a hire car when staying there. It has great views, is quieter. It has a swimming pool and a gym. For families with children Crown Resorts recommends Delta Mar and La Riviera because everything is within easy walking distance and the beach is so much closer. If you look at the picture above, you’ll see the La Riviera resort just behind the Reception. The Club Delta Mar Reception opens every day at 9am but like the Club Calahonda Reception, evening closing hours are variable in winter or summer. 2) Crown Resorts Club Calahonda Reception serves the Calahonda resort and is accessed by bus from the middle Calahonda bus stop. It is a short walk up from the A7/N340 highway. 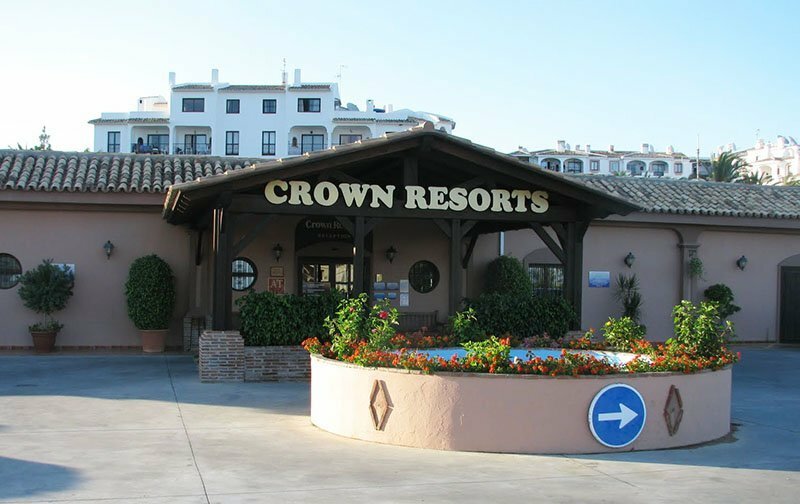 3) Crown Resorts Club Marbella Reception serves the Marbella Resort complex and is the main reception for all three resorts and is open 24 hours a day. If you are arriving late at any of the other resorts and need help, phone Crown Club Marbella Reception on + 34 952 933 674 It’s further away from the busy A7/N340 coastal highway and if you are arriving for the first time by bus, I recommend that you get off at the first Calahonda bus stop travelling from Fuengirola and instead of pulling your suitcase up the hill, take a taxi for the short distance to the resort. I suggested to Marvelle also that she could take the bus back into Fuengirola and the children would enjoy the Aqua Park or perhaps a visit to the Fuengirola Zoo. Marbella is 35 minutes the other way by bus and she could have a look around in the Old Town before taking a ferry from the Puerto Deportivo in Marbella to Puerto Banus. From there she could taxi back to Marbella or take a local bus back to Marbella centre before catching the Fuengirola bus back to her Crown Club Resort. Next articleBus, transfer, or car rental from Malaga Airport? Your posts are very informative and have given me the courage to try out Spain's public transport rather than pay a fortune for a taxi to and from the airport. Please can you help with a query. Going by bus from Riviera del Sol to Fuengirola bus station can I buy a bus ticket on the bus? If not where can I purchase a ticket and how much will a ticket cost? Can I buy one in advance say the previous day? Thanks for all the information on public transport to and from Fuengirola and Riviera del Sol. Please can you help me with a query. If I am travelling from Riviera del Sol bus stop (Near Chez Max Bar) where do I buy the bus ticket? Can I buy one on the bus or the previous day from a shop? Also how much will it cost? Loved the idea of the short cut thru the fence and tried to find it but we couldn't find the short cut. There is a small cement bridge across at the end of the hedge and we went up behind the basketball courts but couldn't see a way into the parking lot so we walked all the way around.